Volkswagen has completely overhauled its natural gas models and is equipping its Polo TGI and Golf TGI with a third natural gas tank. This allows the Polo and the Golf to respectively travel up to 60 and 80 kilometres further in pure Compressed Natural Gas (CNG) mode. Understandably, drivers of natural gas vehicles only want to use petrol in exceptional cases. 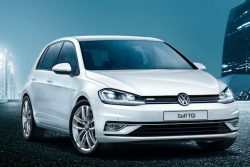 Volkswagen has therefore equipped its natural gas models of the Polo TGI and Golf TGI with a third natural gas tank made of specially coated, high-strength steel. For improved driving dynamics and efficiency, the Golf TGI comes with a new 1.5 litre four-cylinder engine, which is powerful, efficiency and environmentally friendly. Proof of this comes from its fuel consumption of just 3.6 kg – 3.5 kg natural gas over 100 kilometres, and CO2 emissions of just 98–95 g/km. The new 1.5-litre TGI engine in the Golf uses the innovative TGI Miller combustion process with a high compression ratio of 12.5:1, to increase efficiency and decrease CO2 emissions. The Golf ‘s tank has a volume of 23 litres and increases the total CNG tank volume to 115 litres, or 17.3 kg respectively, which offers a range of up to 422 kilometres in WLTP (Worldwide Harmonized Light-Duty Vehicles Test Procedure). 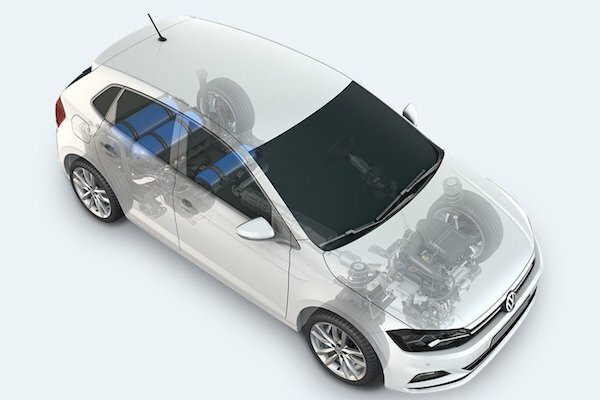 On the Polo with 1.0 three-cylinder engine (66 kW / 90 PS)2 the additional tank carries 16.5 litres and extends the natural gas storage to 91.5 litres in total, or 13.8 kg respectively, meaning that the Polo can travel up to 368 kilometres on CNG in WLTP. As a back-up, both models come with a petrol tank – albeit a much smaller version. Driving with natural gas significantly reduces CO2 emissions because the combustion of CNG produces less CO2.Compared to petrol or diesel, natural gas contains a significantly higher amount of energy and a lower carbon fraction. This means that driving in CNG mode produces around 25 per cent fewer CO2 emissions than with petrol. An even better CO2 balance can be achieved by fuelling with biomethane or e-gas, both of which are renewable fuels. Biomethane is extracted from plant residues; e-gas is produced from surplus green energy (power-to-gas), which are added to the fuels. What is more, the exhaust gas contains significantly less carbon monoxide and nitrous oxide (NOx), while the fraction of soot or fine particles is minimal. Anyone who already drives a CNG vehicle also benefits from comparably low fuel prices in many countries. In Germany, for example, the cost saving compared to a diesel vehicle is currently 20 per cent, or 40 per cent compared to a petrol vehicle. The new natural gas-powered TGI models are available to order now. Announced at the end of January, the trade magazine auto motor und sport chose the winners of its “Best Cars 2019” Reader’s Choice Awards in Stuttgart today. Three models of the Volkswagen brand, the natural gas powered eco-up! (“Mini Cars” category), Polo (“Compact Cars” category) and Golf (“Compact Class” category), were among the winners.